I offer affordable website design for you or your business. to help your project or business grow then why not give me a try. My affordable website designs are mobile responsive so customers can browse your website on a mobile device easily. This helps retain visitors to your site as many more people are browsing the web using a mobile device. 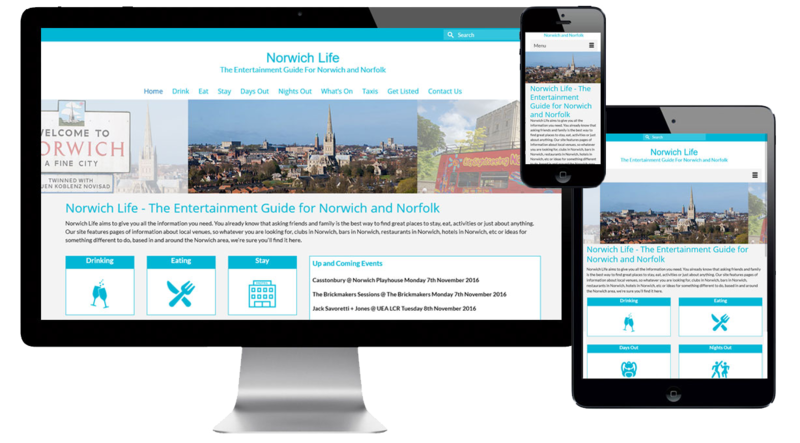 I am a freelance website designer based in Norwich. If you are looking for a well-designed mobile friendly website for your business, organisation or just for yourself, then I can design and build a website that works for you. You have the vision, I have the necessary skills to turn that vision into reality. My affordable website design pricing suits all startups and businesses. The price you see is the price you pay, there are no extra or hidden fees. Affordable website design doesn't mean cheap and it doesn't mean amateur. I aim to offer great looking and performing websites at affordable prices. Let me build you a professional, affordable website to promote you or your services. No matter what type of website you are looking for my affordable website design plans will suit all startups and businesses. Whatever your budget, I have a plan for you. All of my websites include the security of an SSL certificate as part of the affordable website design package. Google have plans to penalise search engine rankings for any website that is not secured by an SSL certificate. SSL certificates are essential if you plan to sell online plus they give a greater feeling of trust to your visitors. Don't forget, there are no monthly or hidden fees to be added to my prices. Don't see a suitable plan for you? Drop me a line via the "Make An Enquiry" link and I can tailor a package to suit your needs. Take a look at some of my website designs custom-built for customers here. Why not give me a try if you are looking for a quality, custom website design. I create functional, modern website designs and have over 15 years experience of affordable website design for individuals and businesses in the UK and overseas. I hold diplomas in website design and social media marketing and am a member of the UK Web Designers Association. No matter what the subject of your website, the stages are always the same. You start out by making an enquiry, we then go to planning. After planning the build phase starts, once built your site is ready to launch. Submit your enquiry and I will get in touch with to talk through the most suitable package for you. Once we have decided on the best package for you and you are happy we will agree to go ahead and I will start to prepare for your website build. The next stage is about planning your requirements in terms of look/feel/layout/functionality. To help with this process I have a planning document which I ask you to complete so I can get an idea of the type of site and design that will work best for you. To start with I will design a mock-up of your website based on the details in the planning document and any other information you have supplied to me. This will give you an idea of what the final design web design will look like. Once you are happy with the mock-up, we will agree the final design and I will build your website. The most exciting part - your website is built and ready to be launched to the world. I will make it live and submit the site details to Google and other major search engines. At this point you will receive login details so you can access the content management system. You will also receive a comprehensive guide on how to edit your content - I am always on hand to help if you get stuck.